It’s March 1st and if you have a Roth and Ramberg Calendar then it is time to flip it over. 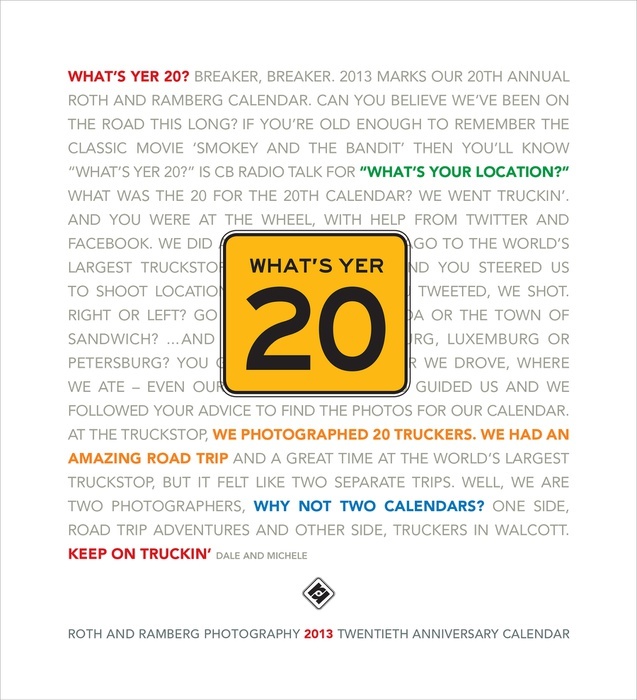 This year was our 20th calendar, thus the theme ‘Whats Yer 20’ was born. It documented our road trip from Chicago to Walcott, Iowa. A drive that would normally take four hours that took us 8 days! During that time we met and photographed a lot of great people. 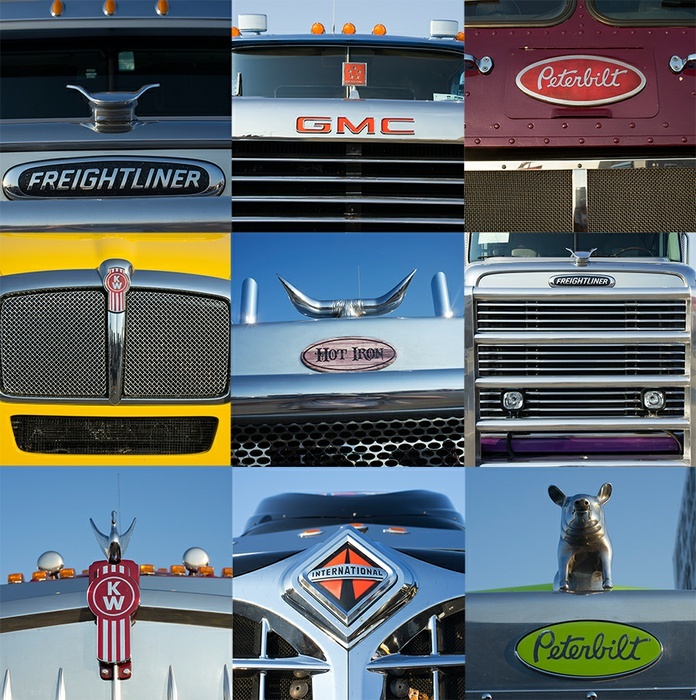 One side of the calendar has our road trip photos, the otherside has black and white portraits of truckers at the World’s Largest Truckstop in Walcott. While driving along the countryside, we spotted an odd building. We had to turn around just to see if it was, in fact, a drive-thru liquor store. Driving, drinking… sort of an interesting combination. There we met the owner of J + J Stop + Drive Thru liquor store - Tom Klukaczynski. Listening to our story, Tom was a little hesitant at first; he seemed to be a bit of a conspiracy theorist. However, in the end he happily posed for photos and shared lots of stories. Besides a calendar, we also produced an online magazine with greater detail of our roadtrip. How do you get it? Well, download our free app (details at the bottom) and it’s there along with the previous two calendar road trips ‘Off the Grid’ and ‘In Search of the Loch Ness Monster’. 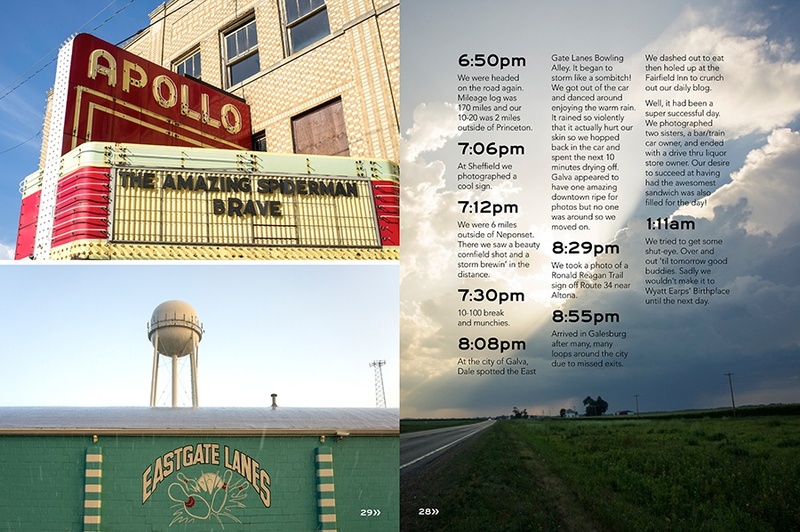 Here are a few spreads in and around Illinois and our encounter with Tom, the Drive-Thru man. The other side of our calendar features a young couple; Travis and Kayla. They were both at the Trucker Jamboree in Walcott Iowa. We couldnt resist the matching t shirts!! If you don’t have a Roth and Ramberg Calendar, then let us know and we will send you one. If you want to read more, you can go online or donwload our app to read our entire ‘Whats Yer 20’ road trip.